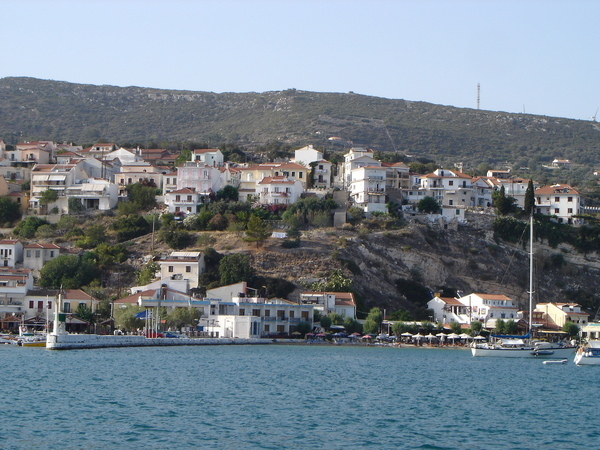 Bozcaada - this small island plays an interesting role in the geopolitics of Northern Aegean. One of the two bigger Turkish islands in the Aegean, Bozcaada is located off the coast of Turkey, near the strategic point of entry to the Dardanelle and the Sea of Marmara. Bozcaada - still known in Greece by its Greek name of Tenedos - was already under Greek rule when the First World War broke out in 1914. However, in the aftermath of Greece's defeat by Mustafa Kemal Ataturk's Turkish republican army in 1922, the island of Bozcaada and Gokceada (Greek name=Imbros, just off the western coast of Gallibolu Peninsula) were handed over to Turkey as part of the peace settlements. Under the conditions set out in the Treaty of Lausanne in 1923, Greek-speaking residents of Tenedos and Imbros were exempted from the compulsory population exchange that had affected millions of people all over Greek Asia Minor and the eastern Aegean. 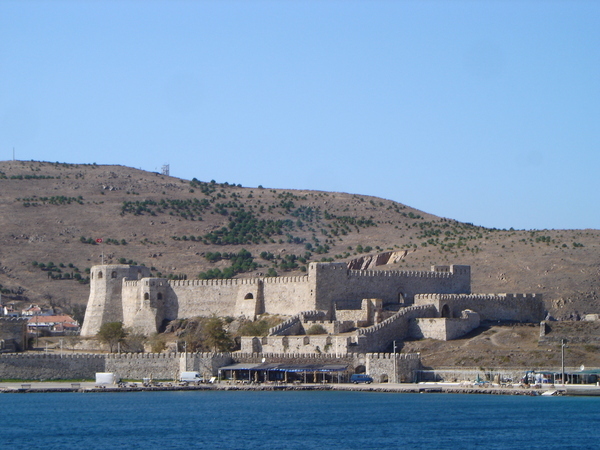 Because of the island's strategic location, a castle and fort had been constructed by the Venetians who held the island prior to the arrival of the Ottomans to ensure the control of shipping movements in and out of the Dardanelles. For a brief spell during Greece's War of Independence, Bozcaada was 'liberated' by the Greek army prior to its return to Turkish control in 1923. 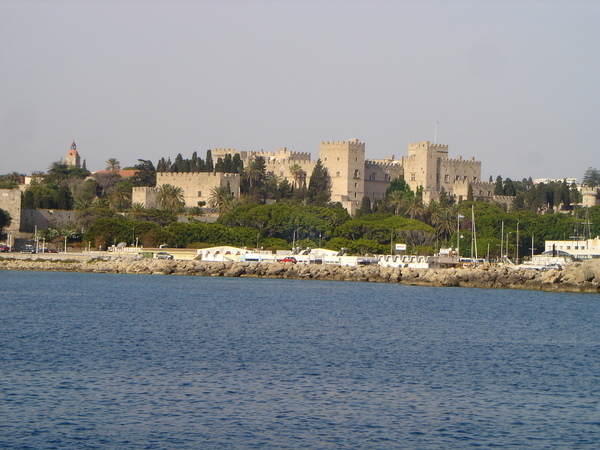 The Venetian Castle of Bozcaada is also the island's most famous landmark. There are still some Greek-speaking citizens of Turkey on Bozcaada, although their numbers have decreased dramatically since the 1960s. Most of them have left for Australia or return to Greece. Those who chose to remain are usually older people. 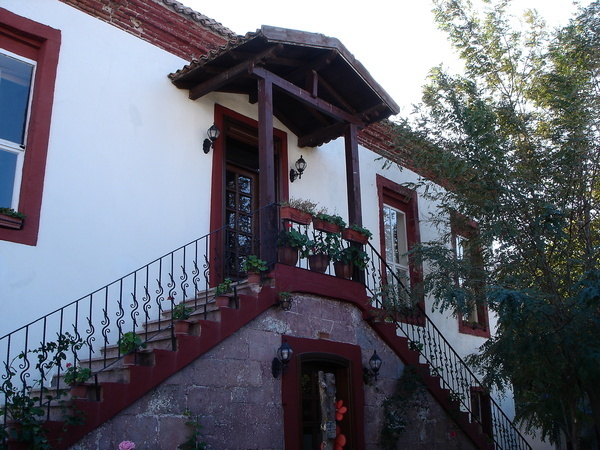 Due to Bozcaada's Greek heritage, there are many pretty old houses in the town centre with a Greek touch. This one is the Ege Hotel, which used to be a Greek primary school. The Aegean town of Ayvalik and the surrounding villages are known for their excellent olives. The region around Ayvalik is one of the biggest centres of production in Turkey of top-grade olive oil. 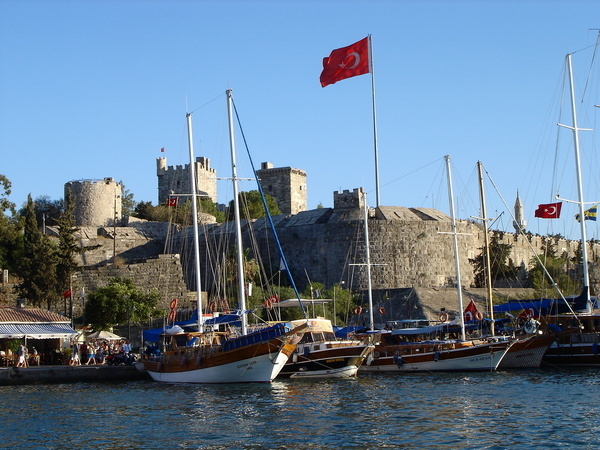 But the town also has a long history, an interesting heritage, and is a popular seaside resort for Turkish tourists. The harbour front of Ayvalik: this part of Aegean is very windy, even in the summer. 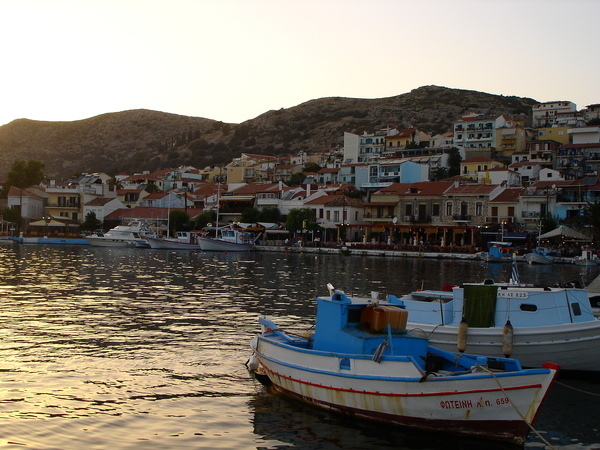 There are direct ferry services to and from Mytilini, capital of the Greek island of Lesbos. However, schedules are prone to change and/or cancellations due to strong winds and rough seas, even in the summer. There are also direct ferry services 2-3 times a week from Mytilini to two other Turkish ports: Dikili (south of Ayvalik) and Foca (near Aliaga and Izmir). Like so many other towns and villages on the Turkish Aegean coast, Ayvalik used to be a predominatly Greek-speaking town, before the enforced population exchange of 1923 changed the lingustic landscape of the region. 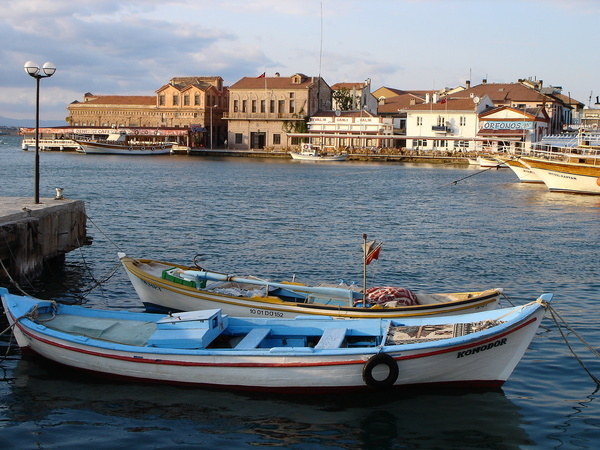 While Greek-speakers were resettled on other Aegean islands, Turkish residents of northern Greece (near present-day Thessaloniki and the Greek province of Macedonia) moved to Ayvalik. Thus it is not uncommon to hear Greek spoken on the streets, even though the speakers are ethnic Turkish Muslims. Many city dwellers from Istanbul visit Ayvalik on weekends to enjoy fresh seafood and run away from the bustling life in a big city. Assos is an ancient harbour town on the Northern Aegean coast, just 2 miles down the hill from the Roman ruins of Behramkale. It was founded by settlers from the Greek island of Lesbos. Do not confuse this Assos with its namesake in Greece: the Assos you are going to read about is located in present day Turkey, about 1.5 hour by bus from the city of Canakkale. 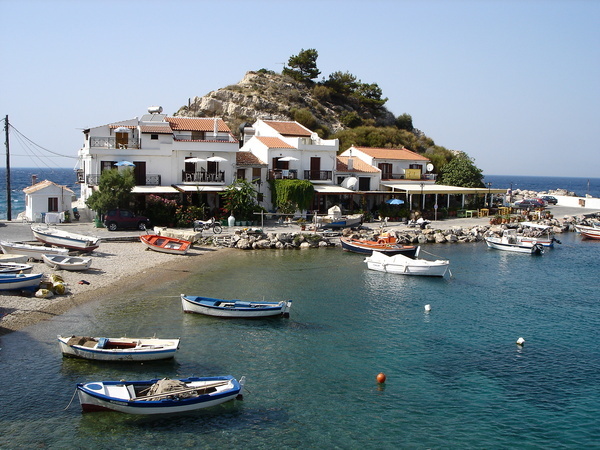 There are several nice boutique hotels in the small harbour of Assos. Most of the people that stay overnight at one of the nice hotels are well-off tourists from overseas who are on a private tour on the way to Izmir and Central Anatolia. Assos is a favourite stop due to its stunning scenery, the relatively well-preserved Roman ruins on the hill top, and the fact that it is located just 1.5 hours by bus from the city of Canakkale. After a long day visiting all the War Memorials on the Gallipoli Peninsula, it is a good way to unwind at this small village. Local Police Station (Jandarma). In Turkey, Jandarmas (equivalent to Gendarmarie in France) are the para-military forces responsible for security in country districts in Turkey. 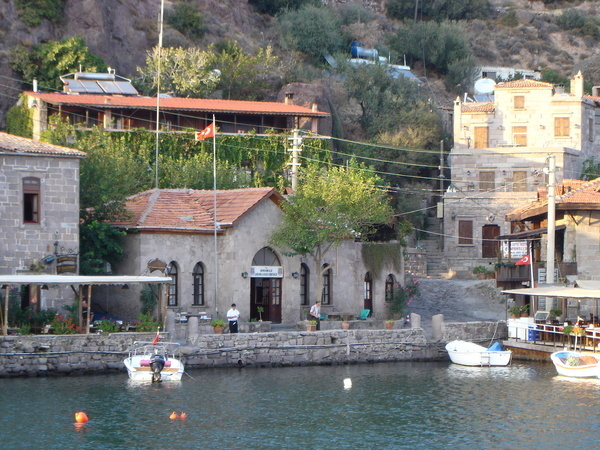 Here is the Jandarma Office in Assos, located in a traditional building. Most of Samos' vineyards are planted with Muscadet, the famous white varietal that makes a sweet, flowery, almost honey-like, white wine. The colour of this wine is golden and has a relatively high alcohol content for a white wine (more than 12%). 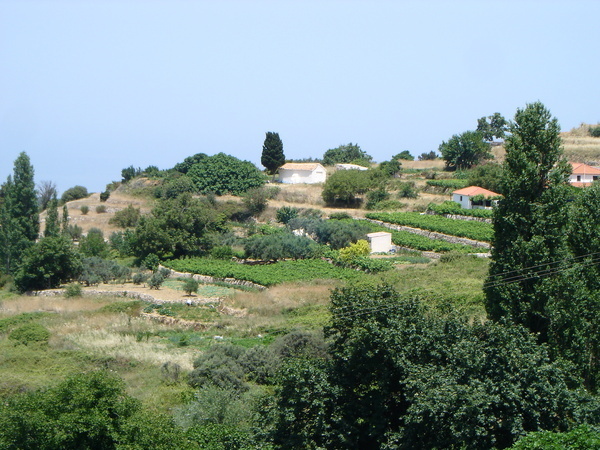 The vineyards of Samos are located on the hilly slopes facing the sea. During the day, long hours of sunshine make sure that grapes have sufficient natural sugar contents essential for the sweet Muscadet wine, while the cooling sea breeze that blows from the Aegean provides for ideal growing conditions during the hotter months of the year. As a result of hot sun and sea breeze, the natural sugar contents of Samos' white Muscat grapes is among the highest of all white varietals. 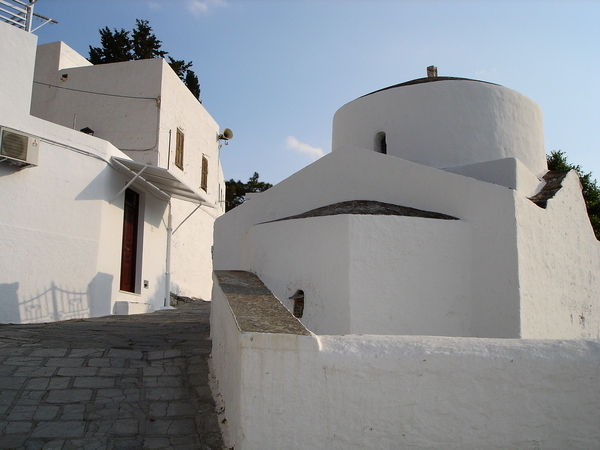 A typical wine village in Central Samos. Viticulture is one of the most important economic activities on Samos. A bottle of top-class white Muscadet from DOC Samos (Samos Wine of Origins) can fetch up to a hundred euro in luxury restaurants in Athens and other major cities in the world. It is a very strange feeling: sometimes you look at a place, and you know immediately you are going to like it. There is some kind of strong emotional attachment, even though I had never been to Kokkari before. The village is about 10km outside of Vathi, there are frequent bus connections to and from Vathi's central bus station, and you can also go by taxi (about 10 euro one way). Being a wine lover, I have always wanted to visit the Greek island of Samos, because it is home to one of the most well-known white varietals - Muscadet (Muscat) grapes - in the world. Viticulture on Samos dates back thousands of years and its famous golden sweet white wines are exported all over the world. Because I arrived by hydrofoil 'Flying Dolphin Zeus' from Kos, the port of arrival was Pythagoria on the southern coast of Samos. The journey was about 4.5 hours. The harbour town of Pythagoria in the twilight - not sure if the town is where Pythagoras was born, but Samos is indeed the home island of the great mathematician. The view of the harbour during the day. 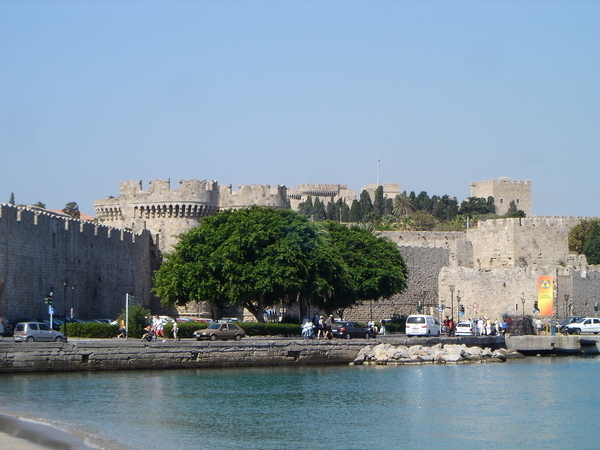 The Medieval City of Rhodes is one of the best preserved Middle Ages citadels in the world. 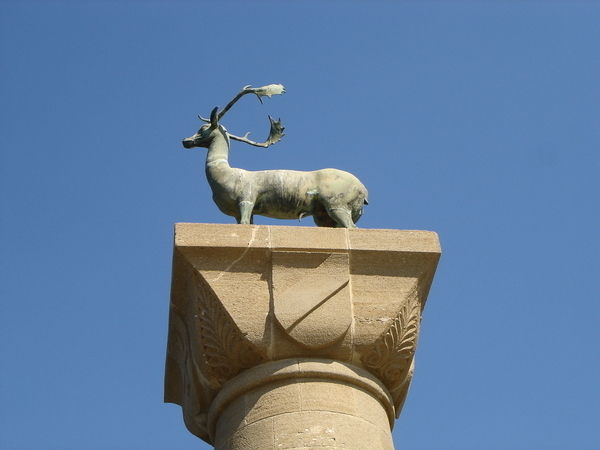 It was inscribed as a UNESCO World Heritage Site in 1988. When the Order of St. John of Jerusalem occupied Rhodes in 1309, they set about fortifying the city. The whole Citadel consisted of the Upper Town and the Lower Town. Most famous buildings in the Upper Town include the Palace of the Grand Masters, the Street of the Knights, the Great Hospital, just to name a few. Built in the Gothic style, these buildings radiate an alluring, mystic charm, especially in the evenings. The ancient town of Lindos, with its Arcopolis perching above the hill, is one of the most popular tourist attractions on the island of Rhodes. There are frequent buses (every 30 minutes) everyday in the summer from Rhodes Town to Lindos. The journey takes about 3 hours. The bus stops at a small square at the entrance to the Old Town. There are stairways and paths that lead to the beach and the seaside taverns. 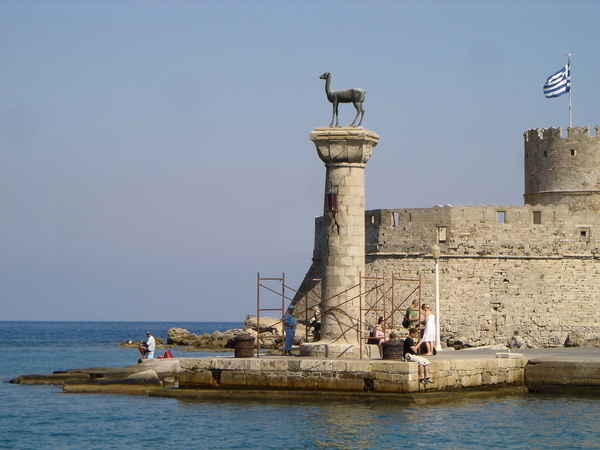 因為 Rhodes 海洋公約與 Ancient Seven Wonders of the World : Rhodes 港口巨像的關係,一直以來 Rhodes 就名列我的 Top 10 必去的希臘島嶼之一. Kalymnos is much more beautiful than I thought. The visit to this island took place under unusual circumstances. I was on a catamaran from Rhodes to Patmos and was supposed to get off at Kos. However, about 10 minutes prior to arrival at Kos Town, suddenly I did not feel like getting off the boat. There was an urge to stay on and travel to another island, just to see how it was like. So I found the First Officer and ask him how much it would be if I continue my journey onwards till Kalymnos. All I need to pay was the fare difference - it was much cheaper than buying a new ticket at Kos. 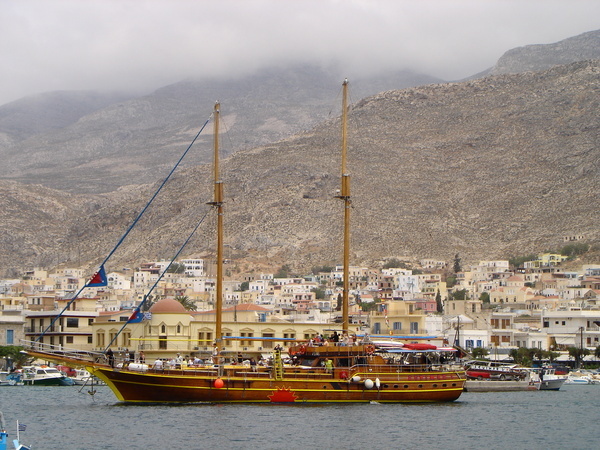 Ever since time immemorial, Bodrum (Halikarnassos) has been well-known for its ship-building industry. Seafaring boats made of wood according to traditional methods are known as gulets. In the past, these boats were used by merchants to transport goods from one Aegean town to another; nowadays. they cater to tourists who spend hundreds of euros on an all-inclusive seven-day 'Blue Voyage' up the famous Gokova Bay. Colourful fishing boats in the Old Harbour in front of Bodrum Town Hall. From here, there are taxi boat services in the summer (May-October) to Bardakci Bay every 10-15 minutes, where you can swim in the sea and enjoy a splendid view of the Castle. The taxi boat service starts at 08:00 in the morning and last boat is at 23:00 in the night. 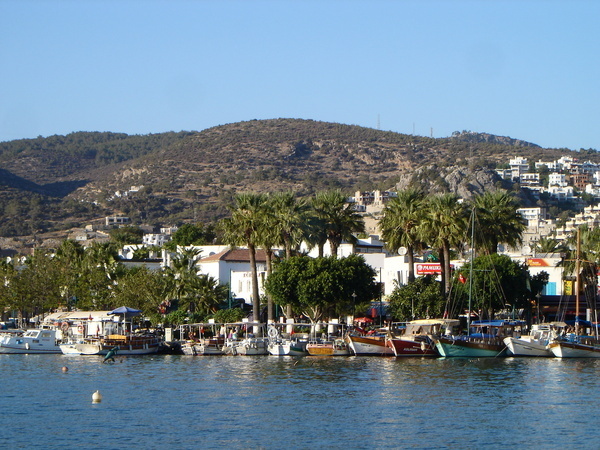 Our favourite seaside town in Turkey is actually Bodrum (although we are not party people). In ancient times, Bodrum is known as Halikarnassos, where one of the Ancient Seven Wonders of the World, the Mausoleum, once stood. 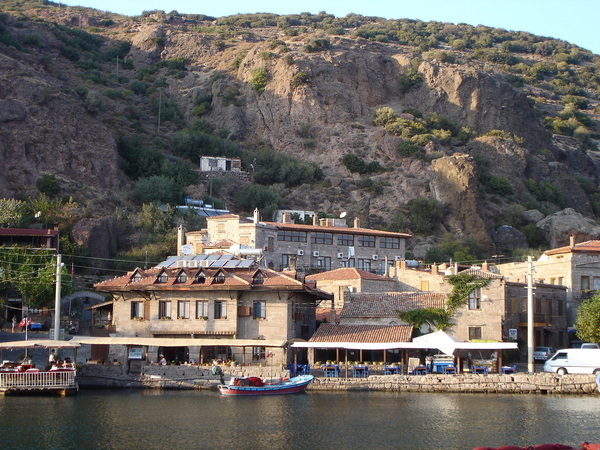 Traditional boats 'Gulets' in Bodrum's Old Harbour. In the background is the St. Peter's Castle. 建於西元前七世紀, Side 位於 Antalya 東方大約一個小時車程的地方,是一個濱海小鎮,也是古希臘與古羅馬時代一個非常重要的港口城市,經手的貨品包括橄欖油和奴隸貿易. Side 這個名字的意思是石榴 (pomegranate). 歷經 Lycian, 波斯帝國,亞歷山大大帝, 羅馬帝國, 拜占庭等等朝代的統治, Side 的舊城區,處處充滿了古羅馬時代的大理石雕刻與建築. 大多數的景點都集中在 Antik Side 那一帶,最著名的就是靠海的Temple of Apollo 遺址. Side is situated about an hour outside the city of Antalya. The town of Side is divided into two parts:modern Side and Antik Side. Most of the sights are located within the Antik Side district. Although Side could get fairly touristy in the summer months, in winter it is a dainty quiet little town full of beautiful ancient ruins dated from the Hellenistic era and the Roman times. 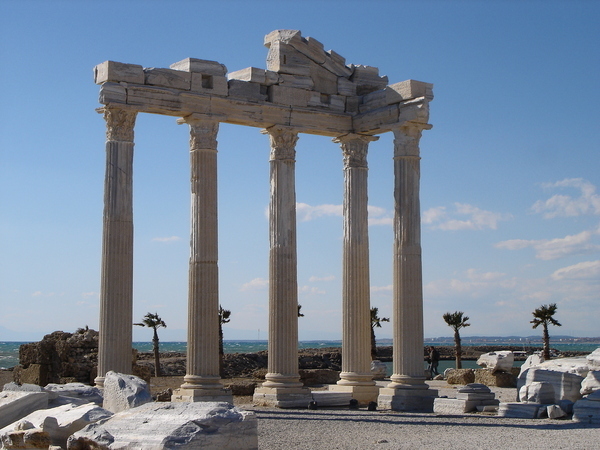 One of the most famous landmarks of Side is the ruins of the Temple of Apollo right on the edge of the ancient town, just a few minutes' walk from the harbour. Built in the 2nd century A.D., the Temple is a fine example of Roman marble architecture. 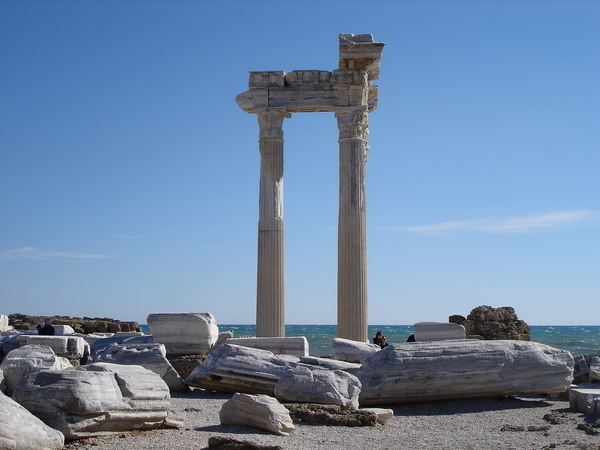 The remaining columns stand majestically against the backdrop of blue sea and blue sky. In the evening, the view of sunset across the vast ocean was stunning. Someone calls it 'the most romantic place' in Side, as lovers hang out after dark and adore the beautiful view of the moon over the Temple and its reflection on the sea. Temple of Apollo 側面照:建於公元二世紀, Apollo 神廟的羅馬式建築廢墟靜立在海邊. 傍晚時分,這裡是情侶們最喜歡 '曬月亮' 的地點, 被當地居民稱為 Side 最浪漫的地方. 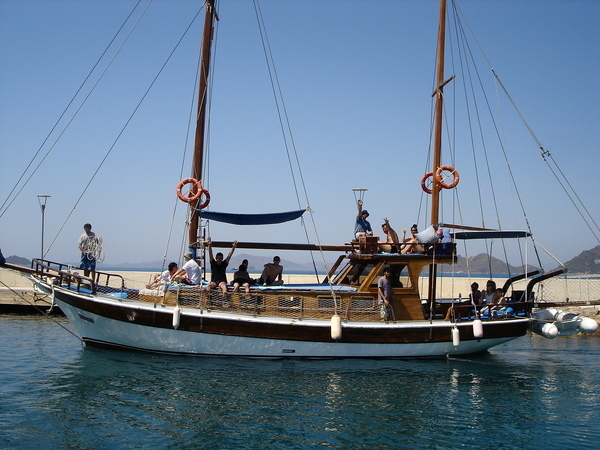 Some people wonder how a one-day boat trip on a traditional turkish gulet looks like. Before I had the chance to experience the sensation of sailing across the Aegean on a traditional gulet, I thought boat trips were all about swimming, sun bathing, fishing and lots of drinks and loud music en route. But it is actually more than that, especially on a hot summer day. While it is steaming hot on land (it was more than 40 degrees Celsius in the shade in June! 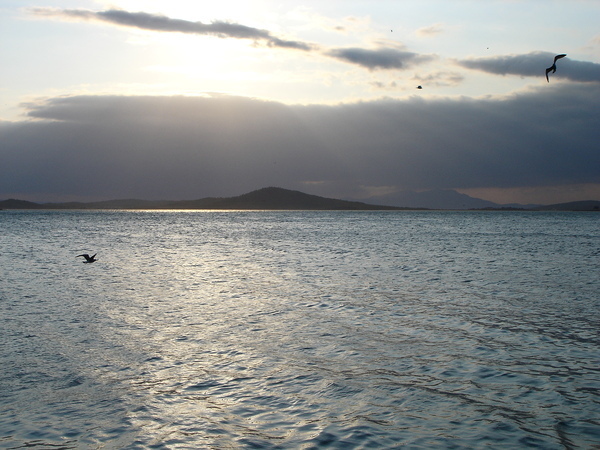 ), on the sea you can feel the cooling effects of the sea breeze, wonderfully gentle and soothing. Of course, lots of sun lotion with a SPF of 30++ or more is am absolute must, otherwise your skin will get sunburnt within seconds due to the reflective effects of UV rays. Even the sea looks more tempting and alluring than on the shore. After you have tried swimming in the sea while on a boat trip, you won't feel like swimming on a beach anymore. The quality and colour of the water in the sea is just much better than on a beach. 舉例來說,從Rhodes到Kastelorizo的許多私人船班,以及從Kalymnos到Mastichari,Kastelorizo到Kas的船班,Rhodes到Nissyros etc. 就是屬於這種網上查不到,但是的確存在的航班. 許多的外來訪客可能會因為在查詢網站或者其他的地方的旅行社查不到有關這些航班的消息,誤以為這些航段沒有渡輪來往而選擇更改行程或取消拜訪這些地方的念頭, 那就太可惜了. B) Catamaran: 新一代的快船, 有一些可載客,再加上數目有限的車輛(長寬高都有限制); 有些則只載客, 不載車輛. 因為座位數目有限, 旺季時最好早二三天訂購. 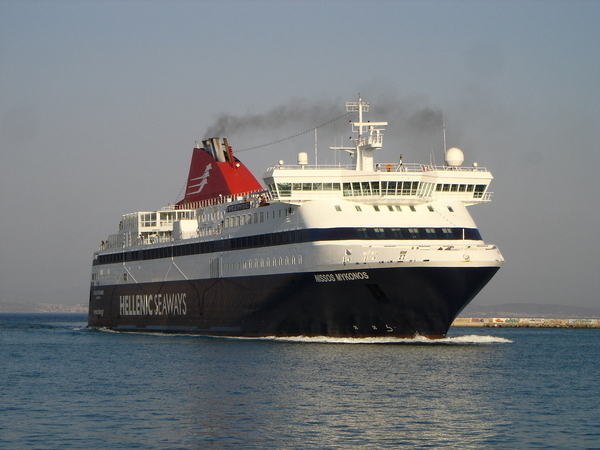 Hellenic Seaways有幾艘新設計的快船,可乘載的乘客與車輛數目不輸一般的傳統 Car Ferry. C) Hydrofoil:高速飛船, 只載客, 不載車輛.因為座位數目有限, 旺季時最好早二三天訂購.